The staff of Arizona Designs Kitchens and Baths understands how to design spaces in your home that are not just functional but also provide comfort and convey the design statement that represents you and your family. Your home should reflect your personality and be an extension of those things in life you enjoy and value. Arizona Designs represents some of the finest cabinetmakers in the United States and carries cabinets for every budget. We take pride in our design expertise and as a group have over 100 years of experience designing the kitchens and baths in homes throughout Southern Arizona. Our cabinet installers also have many years of experience and are also proud of the reputation we have for providing quality products and services from start to finish on a project. What differentiates us from our competitors? One word – DESIGN. 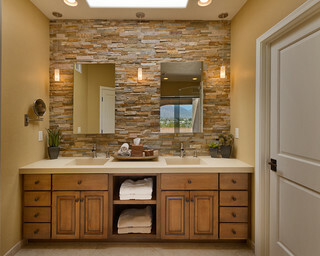 It is in our name (Arizona Designs) and it reflects how we approach every opportunity to work with a homeowner. We understand that good design is a process and know that there are opportunities to utilize the principles of good design on even the smallest projects. The relationships we have established with suppliers over nearly 25 years of business facilitate our effort to design your living spaces. We work with local countertop and stone suppliers, appliance dealers, contractors from many trades and local interior designers and builders in order to meet your new construction and/or remodeling needs. When you work with the staff of Arizona Designs, you don’t just get new cabinets for your kitchen or bath. You also get experience, expertise, quality and service as you seek to improve your home. We know that in the end, the appearance and function of your home significantly impacts the quality of life you enjoy with your family and friends. Our aim is to make a lasting, quality contribution to the way you live.